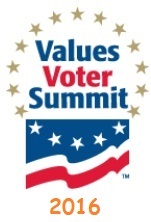 The Values Voter Summit is an annual political conference for American social conservative activists and elected officials from across the United States. Since 1983, Family Research Council (FRC) has advanced faith, family and freedom in public policy and the culture from a Christian worldview. FRC is the leading voice for the family in our nation's halls of power. FRC is a non-profit organization whose vision is a culture in which human life is valued, families flourish and religious liberty thrives. Ben Carson: $18T national debt pales with $200T liability fiscal gap. Donald Trump: Minorities in disaster cities: what do you have to lose? Donald Trump: Disadvantaged students are trapped in failing schools. Donald Trump: Money follows student to public, private or religious school. Ted Cruz: Take on EPA and agencies that strangle small businesses. Donald Trump: Obama paid $1.7 billion cash ransom to Iran for hostages. Ted Cruz: Greatest threat facing America is nuclear Iran. Ben Carson: Foreign development aid is a win-win situation. Donald Trump: ObamaCare is government control over our everyday lives. Ben Carson: Our southern border is so porous, anybody can get in. Donald Trump: Our media culture often mocks and demeans people of faith. Donald Trump: Cherish and defend our Christian heritage. Donald Trump: Repeal LBJ law: let preachers talk politics, tax-exempt. Ted Cruz: Religious liberty: Don't lock up Christians like Kim Davis. Ben Carson: Muslims can be President, if they subjugate their beliefs. Donald Trump: Military and cyberwar to prevent ISIS genocide of Christians. Donald Trump: Help those in need by massive tax cuts & cutting regulations. Ben Carson: America provides opportunities for poor. The above quotations are from 2015-2016 Values Voters Summit.